Budweiser Blog: AutoCAD for Linux? One of the most frequented questions on CAD discussion web sites is the theme of AutoCAD version for Linux. Well, to put it short - there is no such AutoCAD and I doubt Autodesk will make one in a foreseeable future. What is interesting is the disproportion of the frequency of Linux citations on the web (not only in web discussions) and the number of real day-to-day users of Linux. For several years, even reputable institutions make us believe that Linux will take over the market of operating systems, or at least that it will capture a substantial part of it (e.g. Siemens Business Systems, 2003: Linux will have 20% market share in 2008). But the fact is that Linux, in 2009, has still only negligible 1% of this market. And it does not increase. Some statistics (web portals) even show a decrease of this figure. The reason is simple - the Windows ecosystem is (and was) much broader and networking of users (world wide web, world wide marketing) help to strengthen this position. Academic sphere and computer gurus cannot change this. This real-world situation of course influences also the software vendors. It makes little economical sense to put much effort into development of software versions for such small market (and a market that is not much used to pay for software). And for a software vendor, porting and maintaining a CAD application like AutoCAD, Inventor or Revit is much more complicated than just recompiling. I don't say that Linux has no sense - it has a strong a respectable position on some niche markets and communities. But it is simply not there on a plain user's desktop. A slightly different situation is with the Apple operation system - Mac OS. Its market share is on similar numbers but it has a stronger position on designers' desktops, especially in the US. Autodesk has always offered Mac versions of its "Media & Entertainment" applications (animation, video, film FX) and it seems that Autodesk keeps broadening this Mac portfolio. 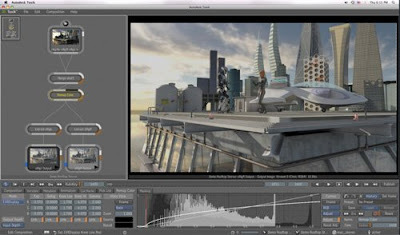 Today, Autodesk has announced MacOS X versions of its 3D design software Toxik, Mudbox and Stitcher (previously only for Windows). I started using AutoCAD in 1985 on an IBM RT system with a Linux OS. As the scuttlebutt went at the time, AutoDesk was promised by IBM that the (then) new RT system would be the 'wave of the future', so the code was modified to include the Linux OS. I was told then that fewer than ten copies were ever sold for the RT and the project was soon scrapped. The main problem with all the AutoCAD clones (incl. BricsCAD) is that they do not fully understand (nor create) the original DWG file format. They use only approximations of the DWG so you cannot rely on the CAD data.